KBM Management (Promotion Page): Danger Vain - Band of the Day ! DANGER VAIN is our "Artist of the Day" for Today (Wednesday) ! Please feature Danger Vain's Links on your pages.. Play their Songs as much as possible.., take the time and give a like, share their songs with your friends and write some friendly comments.. Any Support is more than Welcome.. You know what to do now ;-))...Thanks Friends !! DANGER VAIN is a refreshing brew of techno elements, a touch of the blues,a diverse range of vocal nuances, and rock and roll guitar power that brings an exciting and colorful groove experience to the listener. Sweet and soulful vocal melodies, heavy guitar riffage and solos, and entrancing groove assaults encompass this artists' diverse and fun-loving musical platform. 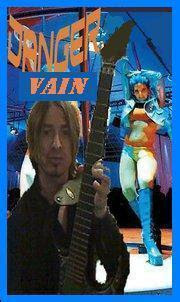 Danger Vain is a musical artist presently residing in Red Deer, Alberta, located in Canada. His passion lies in singing, guitar playing, and composing. Of course the icing on his 'cake' ultimately lies in performing, and connecting with his diverse musical fanbase, which spreads over a few different genres. Though mainly influenced by both techno and hard rock, Danger Vain's list of musical inspirations is as diverse as it is long. Artists like Jimi Hendrix, Kiss, the Edge, Jimmy Page, Red Hot Chili Peppers, Stevie Ray Vaughan, Zakk Wilde, Slash, Nine Inch Nails, White Zombie, Skindred, and Yngwie J. Malmsteen, line Danger's guitar heritage. Vocally, Danger Vain is inspired by artists like Robert Plant, the sadly missed Freddie Mercury, Christina Aguilera, Paul Stanley of Kiss, David Coverdale, Prince, Sting, Madonna, Steven Tyler, Rob Zombie, Lady Gaga, Gwen Stefani, Seal, Vince Neil of Motley Crue, Steven Perry, Dave Matthews, Ozzy Osbourne, Trent Reznor, and of course, the late great Elvis Presley. The compositional styling of Danger Vain is expressionistic in its form, and works to combine techno groove with guitar power and a "blues meets raw" vocality.
" I grew up musically during a time when shred was dying, country rock was booming, and the alternative scene was birthing. Techno was still going strong, and I wanted to hit the clubs that had the wildest women, so dance music kind of grew on me. I wouldn't throw down my leather for a Stetson, and I wouldn't pawn off my Ibanez for a Gretsch, so the result became my musical evolution." Danger is big on writing as well. " I like exploring my humanity when it comes to writing, you know. Sometimes it's something I'm dealing with, or something I'm choosing not to deal with, but you can be sure it's been on my mind before it hits the paper." An avid conspiracy theorist and anarchist, Danger Vain is not afraid to speak out when it comes to the Status Quo. "I'm working hard to keep it restrained somewhat... It's hard to touch on the taboo topics in music or in conversation and get the message across when most people are scared to bring them up themselves. Music isn't the purpose for that kind of subject matter, but it can be a comfortable medium for sure..."
Support and help each other and become the next "Artist of the Day"